Perhaps the name of Sahara Hotnights singer Maria Andersson's boyfriend rings a bell - Howlin' Pelle Alvmquist of the Hives. Or maybe you just know Sahara Hotnights, because you swear you've seen the name somewhere; that would be the press' fault. Sahara Hotnights has been dubbed "the next big thing" by several sources since the garage band explosion. They all say keep watching them, Sahara Hotnights is going to be huge, huge like - like what? The Hives? That ship has already sailed back to Sweden and has waved goodbye to a rather apathetic American audience. Sahara Hotnights is constantly lumped with the Hives romantically and musically, and it doesn't help that they just supported the Hives on tour. Though the songs are not as belligerent as previous singles "Alright Alright (Here's My Fist Where's the Fight?)" and "On Top of Your World" from Jennie Bomb, brawny riffs and secure vocals are prevalent throughout the band's latest release Kiss & Tell. Sahara Hotnights are not quite as masculine and instigative as the Donnas, yet they are in the same vein as the 80's revival male band The Killers. Embracing their femininity and strength, they write kitschy yet catchy compact songs about guys, of course, but with a touch of girl power left over from the Spice Girls. Sahara Hotnights' poppy choruses would make the Go-Go's proud of their own coke-addled achievements. All the songs fall into the same tempo: not too slow, yet not too fast to dance along with, a meandering speed. It's surprising that synths are not credited in the songs; the instrument was quintessential in the 80's. Several songs including "Who Do You Dance For?" and "Empty Heart" feature guitar parts that emulate synths. "Who Do You Dance For?" begins with what seems like a typical punk intro, heavy chords and strumming, but also has a new wave flourish of synth-like notes. The backing vocals, for the most part, are well-balanced, but in "Walk On the Wire" and "Mind Over Matter," the support sounds like elementary and ineffectual yelling. The saccharine backing does not fit in with the combative guitar strumming and drumming. "Hot Night Crash" is their first single off the album and it is a fair choice. It's aggressive enough to incite foot-tapping from listeners of both genders. The subject of a complicated and tumultuous relationship, the song is quite universal, aimed toward the targeted youth audience. In "Keep Calling Me Baby," Andersson taps into a Chrissie Hynde impression in an otherwise dull song. At a second over four minutes, "The Difference Between Love and Hell" is the longest song on the album in which all the songs average around three minutes. The verse instrumentation on this track could be taken out of any rock song, but the chorus is as poppy as can be. 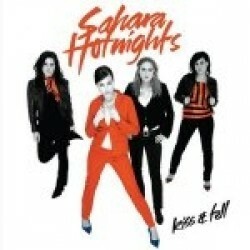 Sahara Hotnights is one of the better all girl bands that I've heard recently. They have the potential to inspire other girls to start bands; either girls think that they need to be just like their favorite girl band, Sahara Hotnights, or think that they can do so much better than that horrendous band, Sahara Hotnights. But then again, any band could inspire those opposite reactions. Kiss and Tell is a decent album, but there needs to be more variation and other adjustments in the songs for this band to be upgraded from "the next big thing" to "the real big thing." Posted Sept. 8, 2004, 4 p.m.